We are looking to get our festival going. We need to get bios of the flyers and what kites are going to be flown here at the DKF. i'll be flying mostly black Sea Devil kites, which are my favorite kites. i do dual line sport kite tricks and do precision flying as well; additionally, i fly quad line kites. i enjoy questioning things about life... and i suspect that most thoughts are second-hand, lifeless, representative shadows (i.e., mere symbols), which most all of us have been indoctrinated to exist as. is measured by his quote eye cue unquote. JJ I pm you the info. Have I mentioned this already? It would be good for the club to have some text for things like this. A little razzle-dazzle for the papers and whatnot that comes up. Well written copy gets published. Just a paragraph would do. The Quad team should have one too. Up to my neck in festival stuff at the moment! Howdy Drafnik... here is a preliminary thing that i wrote up for possible use with the Pontiac Festival; feel free to use it (or any of it) for anything with your festival. i'll definitely be coming! Please (anyone), regarding what i wrote... let me know what to add or delete, or whatever... or maybe leave it the way it is. i was thinking it could be used for fliers for distribution in the local schools, and for possible use in the local papers. The Pontiac Kite Festival will be occurring on August 25th and 26th! Come along with the family and enjoy the festivities! Kite professionals (from the Illinois Kite Enthusiasts Club), and from other locations, will be present to provide direct assistance with kite flying techniques. There will be periodic demonstrations by dedicated kite fliers. You can come to watch and (if you want) can bring your own kite to fly; or you can purchase one during the festival; Chicago Kite will be present, with a variety of unique kites available that you can purchase. Kite flying is no longer an old-fashioned hobby merely involving small, primitive and crude designs which flutter by way of the whims of the wind. Many of today's modern kites are very controllable and can do precision patterns in the sky, as well as innovative tricks that require a great deal of skill and finesse. Competitions exist, wherein participants can try to excel in various categories. The sport is gradually evolving, and may one day become very popular. One type, of sport kite flying, involves controlling the kite with two separate lines (one for each hand). These dual line kites can do precision patterns in the sky (such as stars, steps and figure-eights); they can also do various intricate tricks, such as spinning in the sky like a top, wrapping up and unwrapping in various ways (head over tail), doing spider-like crawls through the air, and spiking the ground with their legs... jumping back into the air and again flying... to name a few of the things these kites are capable of. Another type of sport kite, quad-line kites, have (of course) four lines (two lines for each hand on specially made C-shaped handles). These kites are masters at precision control and can fly forward as well as backward, fly sideways, fly quickly and come to a dead stop, spin like wheels, and make clock-like movements with impressive intricacy. Additionally quad kites can be flown together by large groups of dedicated fliers... doing intricate criss-crossing maneuvers and very impressive mass-pattern displays, wherein, for example, the kites form the image of a small ball, but then separate to give the appearance of a much larger ball; or they can interweave among each other with very intricate patterns and criss-crossing movements. Additionally, there are some very impressive single line kites out there these days. Some of them involve very elaborate designs, such as being in the shape of an octopus, giant gecko, trilobite, giant crab, or dog. 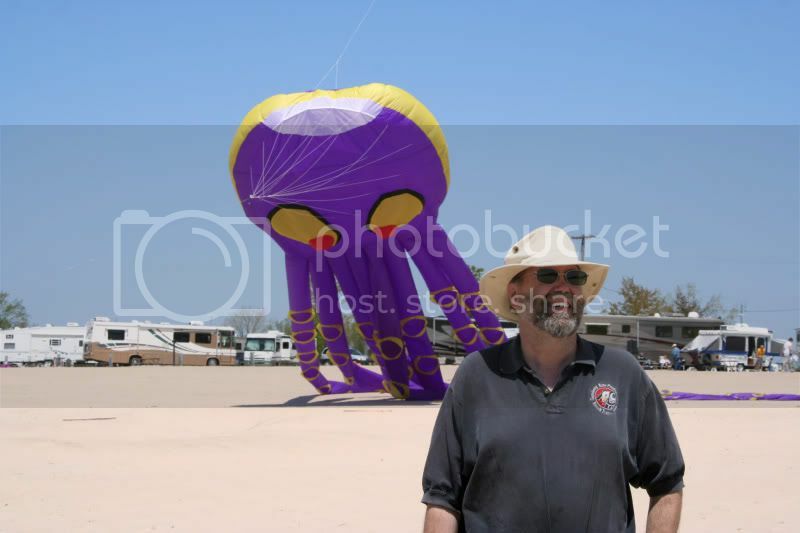 Some of these kites are massive, being over 70 feet long, involving a great deal of labor (to make and to fly) and are very detailed in terms of the creature which they are designed to represent. There are also small single line kites, which are very interesting to watch and to fly... the Prism E0 series, for example, are interesting box kites which do not look like box kites at all... they have very futuristic designs, and look very impressive/unusual! Regular single line kites, though, are plenty of fun in and of themselves! Come join with the entire family and friends! Bring lawn chairs to relax in... and fly some kites along with us! Kite flying can be great exercise! There will be plenty of ongoing demonstrations, involving the various types of kites, taking place throughout the day! It can be very relaxing and enjoyable; plus it can be as challenging and complex as you care for it to be! The festival will be at the Rec-Plex fields (i.e., the old municipal airport)! And if we have to have a picture I would prefer this one to the one Dave took off my site and submitted. Or this is a good one too...especially if cropped down.